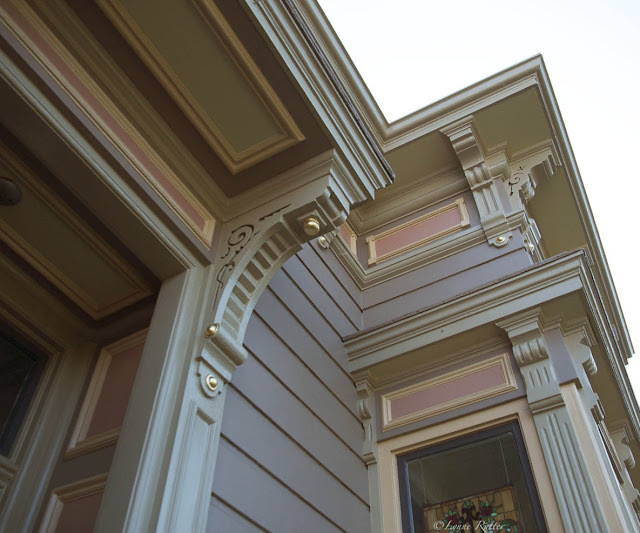 I am excited to show you this recently completed color project - a Victorian in San Francisco a stylish new artistic dress. 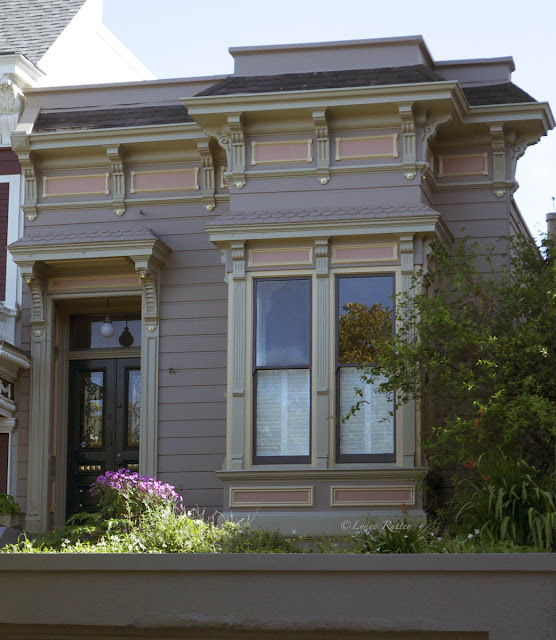 This 1880s Stick-Italianate Victorian house in the Western Addition was long overdue for a paint job. Pale and peeling, it was nearly invisible and set back from the street behind an added garage and a tangle of overgrown plants. The owner asked me to help make the house show up better, and give his home an artistic look using some of his favorite colors. I created a scheme using a muted split-complimentary palette of mauve, green-grey, ochre, and rose, with hints of purple and peridot, and of course, some well-placed gold leaf. This isn't necessarily an historic color scheme, but such colors were popular during the Aesthetic Movement, along with those other "indescribable colors" that I have been studying lately, and which provided inspiration for this design. The garage and foundation walls were painted a warm grey, very simple and plain so as not to compete with the house. The roof of the garage will become a front garden. Originally I suggested an intense peacock teal for the front doors, picking up some of the color in the stained glass insets, but we decided to use a deep phthalo green/black, for a more formal look. Gilt elements on the glossy doors make for a stunning entrance. Paints used on this house are by Benjamin Moore and C2 Color. Lynne, you are so talented I love the panels picked out in Ochre and Rose. Gorgeous. Lynne this home is stunning in its new finery!! I adore the color palette. I will have a post up tomorrow and it will include some decorative painted pieces. Lynne, this is a beautiful color combination — I especially like the way the mauve and gray-green work together. And the door is stunning. It makes me take a second look at my front door! I like to do whatever makes the door look its best. sometimes a great faux bois finish is just the thing. 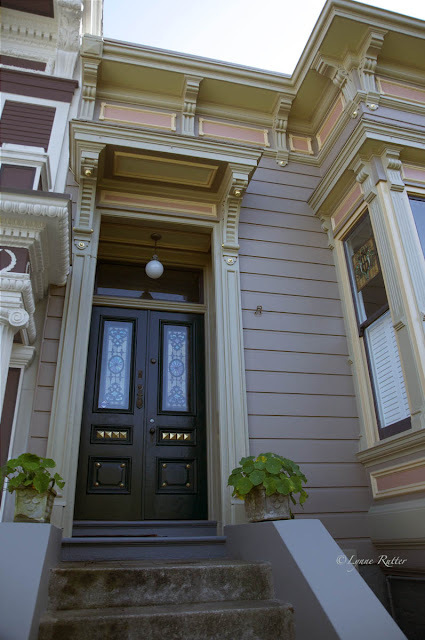 I do think when the door is painted multiple colors like the house, it isn't as visible, so i tell people it need not "match" the house" so much as be compatible with the palette. And especially if there are stained glass panels I like to keep it simple. Fine Paints of Europe makes a really great gloss enamel for doors. Lovely, lovely color combination! I know where this house is...these new colors will perk up even the homes around it. I, too, like the color choice for the front door. Elegant, but subtle. This is just stunning. Thank you for sharing. Awesome blog and outstanding Exterior work and great color combination Fabulous job mind blowing thank for sharing amazing post. Thanks for the props all. It's proving to be a popular house! Love the color choices and, of course, just the right amount of gold leaf. We get to see lots of great doors when we visit Pieter's family in the Netherlands. The deep phthalo green/black is always a stand-out. The (alkyd) paint they use there makes for incredible, glossy smooth shine that you rarely see here. Hello Lynne, I am so glad to have found your blog - I'm Dutch and live in England, working in historic houses and 'trad' private ones - I'm always campaigning for what I call 'darker lights' - which suit authentic interiors and (not so perfect) antique furniture and artworks so much better. On visits to California (not yet SF sadly..), and also western Canada I saw many of these typical wooden houses of the early 20th century and was totally amazed at how DARK people paint these! almost black sometimes and really dark windows - which in England are invariably bright white ... or perhaps grey beige but never as dark as I saw there. Somewhere you say that this is a recent trend ; so I wonder how authentic that actually is. In Holland historic window surrrounds are often painted near white (whith the windows themselves black-green like the front doors), but there is a rend now to go darker there too, which is historical as the surround is 'supposed' to be made of stone, so the colour should mimick that. Another thing I noticed in the US and really liked was how MATT the paintwork often was. In the UK outside paintwork is usually done in highgloss, which I hate! I liked how you call these colours 'undescribable colours', as that's exacty what they are! It's a very subtle mix of 'almost' colours, isn't it. Most of the color schemes I design are not "authentic" in that I am working with my clients' preferences and newer paint technologies. I do try to observe historic references and rules for placement and I have done many houses where we tried to make the colors as authentic as possible. 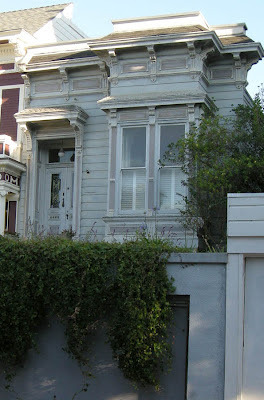 In fact many of these smaller Victorians were paint white and only white originally and they look charming that way, but in an urban setting like this they can get horribly dirty. After WWII the Navy gave away thousands of gallons of battleship grey and white paint (full of lead!) which lasted a long time. It wasn't until the 1970s that the house started getting a lot of color and became the "Painted Ladies" for which San Francisco is now famous. A true gloss exterior paint is kind of rare in California due to our VOC laws, and they don't hold up as well as they used to, but we can get some products to use on doors and window sashes. "Hollandlac" by Fine Paints of Europe was used on the door in this case. Ah, I never realized these houses were white originally - so it's a '70/'80s Victoriana/nostalgia fashion then all these exterior colours I guess. Do you do things like paintscrapes to research the colours btw? The colours you use on this particular house are authentic for interiors though. I recently visited a virtually unchanged late victorian house in the Netherlands, where the ceilings are picked out in exactly these muted, undescribable, rather beigey colours. sorry, I feel I'm invading you blog :-) feel free not to publish ! no worries David, it's nice to hear from you. Thanks for the link ot that very interesting house museum. What a great case of "passive preservation" there! In this case my client was attracted to a set of colors that happen to be popular (for interiors, and for clothing) around the time his house was built. I can and will do and exploration of the original paint if asked but often times the paint has all been stripped off to abate the lead. In many cases the client doesn't like the original paint scheme anyway. I love the outcome of the pointing project. The colors used made this house a compelling and luxurious one. The exterior design and the paints created a very nice complement. This is truly a good inspiration.